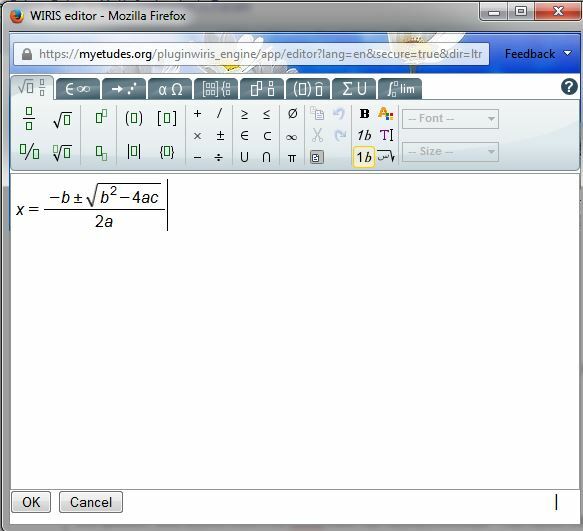 Wiris is a visual editor that allows inserting mathematical formulas easily into content. It is available to instructors and students in all areas of Etudes where you can compose with the editor. You can use a large collection of icons nicely organized in thematic tabs in order to create formulas and insert them into your content. To launch the MathML editor, click on square root icon of the editor’s toolbar. The editor will open up. Type your formula and accept it by clicking on OK. It will then be added to your module, assignment, discussion topic, etc. When you post it, it is displayed as an image. The editor creates a full description of the formula on-the-fly for you and it is included under an ‘alt’ tag. This is then read by screen readers for blind learners. The user guide for the MathML editor can be found under the “?” mark when you open the editor. Note: You can use keyboard shortcuts to copy and paste (Windows: CTRL+C and CTRL+V) in the WIRIS editor. However, the pasted object will not appear until you click the mouse.